Housing Minister Dr Roodal Moo­nilal said yesterday approximately 8,719 housing units will be delivered over the next two years to citizens of Trinidad and Tobago. 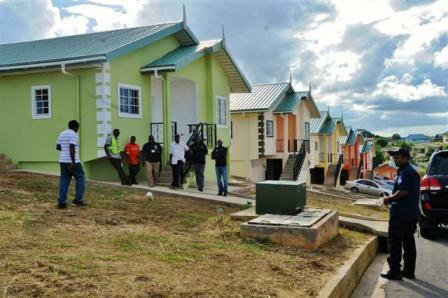 Moonilal made the statement at the key distribution ceremony in Cypress Hills, Union Hall, San Fernando, where 200 families joined 4,264 persons to receive keys to new homes from the Hou­­sing Development Corporation (HDC). Prime Minister Kamla Persad-Bissessar said when she turned the sod in February 2011 for the Cypress Hills housing development project, she envisioned herself returning with a level of pride. “The truth is, today, I return with a level of caution for all of you. The opportunity you have is that you all will be the makers of the future of your community. You will decide if it is kept clean, if it is kept safe, and most of all, if it becomes a place where families want to live and raise their children. Every decision you make, every concern you ignore, every tree you plant, everything you do will decide the future of your community and it is for you to do the right thing”, she said. Moonilal said the distribution of houses by the Government was not doing a favour to citizens but, instead, it was the State’s responsibility. “We see it as our responsibility to stand by our plans and policies. And our policy is that we are crea­ting home ownership for citizens, and we are very meticulous about the construction of quality homes”, said Moonilal.